In previous articles I have described the challenges resulting from incomplete progression of infant reflexes, and how “retained” reflexes are at the core of many academic and behavior issues. Here I have refreshed a story from some years ago, about a client who experienced a profound shift through integrating a key infant reflex. Annie was in my office for a session because she wanted to resolve her digestive issues. She suffered from “irritable bowel” syndrome, periodically experiencing extreme pain and bloating in her lower abdomen, along with diarrhea and nausea. Bouts would last for days, during which she was miserable and sometimes had to stay home from work. After a particularly intense series of bowel attacks two years ago Annie’s doctor put her on a program that included a very restricted diet, prescription drugs to relieve bowel inflammation, and colon hydro-therapy (colonics). Her diet included only the most basic, bland foods. She could eat no starchy vegetables, no grains or flours of any kind (which meant no bread, pasta, rice or millet), and especially no processed foods, onions or raw garlic. This regimen helped a lot, but she had to stay on it very closely. If she nibbled on something outside this limited diet (especially her favorite — ice cream) she experienced extreme symptoms that would last for days. Annie’s story raised my curiosity. I knew that bowel issues are closely associated with retained “Spinal Galant” reflex. In children this often manifests as bed-wetting or bowel incontinence. In adults it may manifest as irritable bowel syndrome. I asked Annie if she had had bed-wetting issues as a child. She shared that she had not only wet her bed until age twelve, but had also had incidents of uncontrollable bowel movements that had even occurred at school. She described the shame and embarrassment of this (and the subsequent teasing from her peers) when the school nurse had to call her mother for clothes in the middle of the day. Unfortunately, her parents chose the “ridicule and anger” route to deal with this issue. At the time of my session with Annie she had already been through years of therapy to weave back together the shreds of her self-esteem. “Can Brain Gym help me?” she asked. I’m not a doctor, so I’m not trained in diagnosing and treating medical conditions. 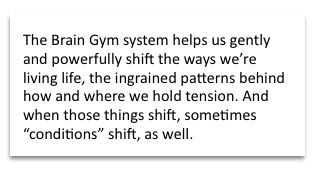 However, the Brain Gym system helps us gently and powerfully shift the ways we’re living life, the ingrained patterns behind how and where we hold tension. And when those things shift, sometimes “conditions” shift, as well. So I explained this, and then asked her this question: “How would you phrase what you’d like to be true? Her answer: “Living comfortably in my body.” That was the goal toward which she moved in her session. As it turned out, the protocols for integrating the Spinal Galant reflex did, indeed, come up as a priority in her session. I explained to Annie about retained infant reflexes, and the specific symptoms associated with Spinal Galant. The Spinal Galant reflex is this: when one side of the low back is stimulated (touching, stroking, etc.) 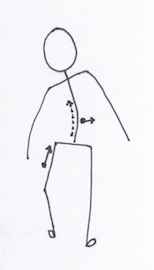 it will trigger an involuntary lifting of the hip on that side, jerking the torso in the opposite direction: touch the left side, and the left hip rises, the torso jerks reflexively to the right, and vice versa. This may be nature's way of supporting the infant in wriggling through the birth canal: the left side is stimulated and the infant’s torso jerks to the right, which causes stimulation to the right side and a reflexive jerking to the left, and so on throughout the birthing process. Under normal circumstances this reflex simply falls away three to six months after delivery: after that time a touch to the lower back no longer results in a reflexive jerking to the side. A person of any age with Spinal Galant strongly “active” will typically be very sensitive in the lower back area. If you try this, always ask the person being checked to use the toilet first, especially if you suspect that they may have Spinal Galant reflex strongly “on.” Simply performing this both-sides-at-the-same-time check can cause a person to spontaneously urinate. Doctors sometimes use this test with infants to take urine samples! This reflex is strongly associated with bed-wetting: perhaps these areas along the lower back are stimulated by contact with the bedding as the person sleeps. I find it interesting to note that individuals who have Spinal Galant reflex still “on” frequently had Caesarean section birth or very rapid vaginal delivery, requiring either little or no use of this reflex in the birthing process. My own belief is that, if this reflex is not called on in the birth process, the body is still “waiting” for it to be used, and so does not allow it to fall away. When this is the case, Spinal Galant reflex is left “on” throughout one’s life, causing all sorts of sensitivities. retained Spinal Galant reflex. Annie recognized several of these traits as part of her childhood or present condition. In addition to her bed-wetting and soiling issues she found elastic waistbands to be extremely irritating, and was also very ticklish. I was happy to see Annie so relieved – and wondered if there were more changes in store for her, as well. What is the relationship between bed wetting, irritable bowel syndrome and Spinal Galant reflex? My belief is that, when one’s body is “primed” to react reflexively in this way, it is much more difficult to develop and maintain control over the muscles involved in remaining continent. And years of effort to control these reflexive movements in the lower back/bowel area may take their toll, and result in these digestive issues. Claire Hocking, the Australian Brain Gym® consultant who developed this means of addressing Infant Reflex issues through the Brain Gym balance process, has worked with numerous “bed-wetting” children, and adults with irritable bowel syndrome. She has seen significant shifts, if not complete reversals, of most peoples’ issues after Spinal Galant reflex was resolved. It is important to note that Brain Gym® balances are not intended as a “cure” for bed wetting or irritable bowel syndrome. But as we address specific life issues through the balance process (such as Annie’s desire to “live comfortably in her body”) we often end up resolving the fundamental developmental challenges that are at their core. and there's an overview in Chapter 8, "Wired for Ability, in my book, Educate Your Brain. Click here to learn more! Copyright ® 2017 Kathy Brown. All rights reserved. Drawing copyright© Kathy Brown, M.Ed. All rights reserved. NEW! Click here for a complete archive of Kathy Brown's blog and newsletter articles, organized by topic. Join my email list to be the first to know when I've posted a new blog article! 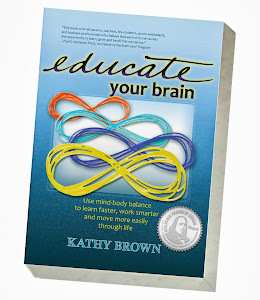 Award-winning book by Kathy Brown covers the simplified basics of the amazing Brain Gym® program, making them both understandable to the newcomer and useful to the seasoned Edu-K consultant. Click on book to order. Kathy Brown, M.Ed., is a Licensed Brain Gym® Instructor/Consultant. Her most recent project has been the completion and launching of her book Educate Your Brain, through which she describes the basics of the Brain Gym program, simplified for the beginner, but with information that truly engages even the Brain Gym professional, as well. It's the perfect companion to the BG101 course, as well as a great home-guide to living and learning with greater ease. Educate Your Brain was recently named a Finalist in the Benjamin Franklin Awards presented by the Independent Book Publishers Association (IBPA). © Kathy Brown 2016. Simple theme. Powered by Blogger.